Where there's heat, there's passion. Welcome to W Mexico City. 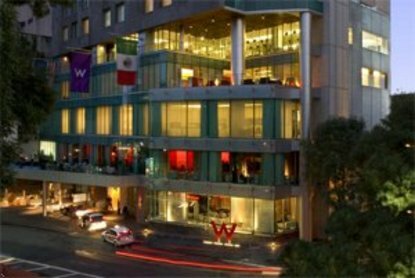 Located in the trendy Polanco neighborhood, we are W's first hotel in Latin America and possibly the hottest W experience yet. By mingling modern design with a zealous commitment to comfort, we've created a sense of warmth and welcome that stays with you long past checkout.Meditate by one of the indoor koi ponds. Rekindle your spirits in The Whiskey. Take an exciting and uncommon breath on The Terrace, by Midnight Oil Company. Or drift outside to the large terrace for an alfresco breakfast or lunch.W Hotels is the place to discover what you've been missing. Sleek in design. Superior in service. Seductive spaces that invite you to linger. From signature restaurants to stunning guest rooms, each W is a savvy blend of style and substance, with just a dash of subversion. So come see it all. Come live it all. Come discover the passion burning within W Mexico City.Special ConditionA Gentle Reminder to Our Guests: The hotel rate, quoted in U.S. dollars at time of booking on whotels.com will be honored with the following methods of payment: U.S. dollar cash or traveler's checks. Other payment methods will be subjected to exchange rate fluctuations. Please check with the hotel for further information.As of Friday, April 4th 2008, the Government of Mexico implemented regulations requiring all Hotels to comply with a Non Smoking Ban effective in Mexico City . This new law prohibits smoking in all closed public areas, including private and social areas, in all public buildings in Mexico City. While Smoking Guest Rooms will continue to be available, this regulation also requires that access to Smoking Floors and Smoking Rooms be solely restricted to adults. Minors under 18, even when accompanied by an adult, are not allowed in these areas.